Usually home field is an advantage for teams. For the 14-U Phenix-Rusk team, getting to play at home ended up being a loss in the opening round of the American Fastpich Assn. National “B” Touranment. After jumping to an early 2-0 lead, the Phenix suffered a 3-2 loss to the Blazer Blitz. It took 24 hours and a field change for the 14-U Phenix-Rusk to finish their hard-fought battle that went into extra innings July 20 at Holcom. Errors in the field and on the bases proved to be detrimental to the Phenix. Head coach Jay Rusk attributed the errors to a lack of focus by his team. 14-U Phenix-Rusk player Kalli McClure celebrates a score during bracket play in the American Fastpitch Assn. National B Tournament on Thursday. Phenix Rusk struck first in the second inning when Natalie Reschek led the inning off with a single. A stolen base and a sacrifice hit got Reschek to third for Jourdan Sumonja to drive Reschek home with a single. Kylie Waite got on base with a walk and made her way around to score when Rose Griffin hit a double to centerfield. Then the Blazers cut the deficit in half during the bottom of the inning with an inside-the-park home run on a ball hit over the heads of the centerfielder and rightfielder. Phenix pitcher Callie Craig recovered, sacrificing only a single before striking out two batters to end the inning. Kallie McClure’s single in the third would be the only offense the Phenix could muster before the Blazers tied the game in the bottom of the third. The Phenix allowed the first runner to reach on an error before that player eventually made it around to score on a passed ball, tying the game, 2-all. In the following inning, it was the Phenix who were making the errors, this time on the bases. Jori Graff got on base with a walk and advanced to second when McClure hit a single. After rounding first too far, the Blazers caught McClure in a rundown that forced Graff to third. McClure slid into the tag for an out. Errors continued to be the Phenix’s nemesis while in the field. After Phenix catcher Andrea Phillips fumbled a hit at the plate, she tried to recover by throwing the ball to second baseman McClure who was covering first. McClure couldn’t get the out, though, as the Blazer runner made it to the base safely. Time expired with the game still tied, but because of the International tie-breaker rule, the game continued. Sumonja, the last batter for the Phenix in the previous inning, took second base to lead off the inning. The Phenix could not manufacture a run even though it had the advantage. The Blazers began their half of the extra innings with a runner on second. They bunted her over to third with a fielder’s choice. It was that runner at third that cost the Phenix the game. Although the team was disappointed with the loss, they wanted to remain upbeat for the rest of the tournament. “Now we know what it feels like to lose by one run in a tiebreaker against a beatable team,” Reschke said. 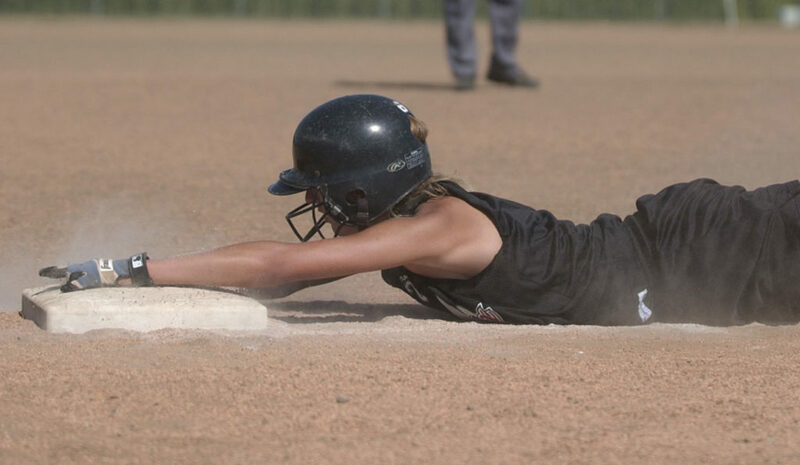 Phenix Rusk player Tracie Weege slides into a base during an American Fastpitch Assn. National B Tournament game at Youth Sports Inc. fields. Reschke said the squad needed to give their fans something to cheer for while playing on their home turf. “We need to be more excited. We have the advantage we need to make the most of that,” Reschke said. Rusk said having a larger-than-normal crowd during tournament games away from Lawrence created more distractions. Rusk said he hoped the opening-round loss would serve as a chance to refocus before the rest of the tournament. “They have worked hard all year and usually respond to a loss like this in a productive way,” Rusk said. Players also recognized the importance of using the loss to motivate them to play well in the rest of the tournament, especially their final two games of pool play. “If we don’t win the next game, it puts us in a bad position going into the double-elimination tournament,” McClure said.